From June 11-17, an inflatable bubble that can fit more than one hundred people will rise at Grand Army Plaza in Brooklyn to house the week-long Democracy Lab. The lab is organized by the Brooklyn Public Library, in partnership with Prospect Park Alliance, Storefront for Art & Architecture, and visitBerlin, and will feature workshops and talks on social justice and civic engagement by established community members of Brooklyn and greater New York. 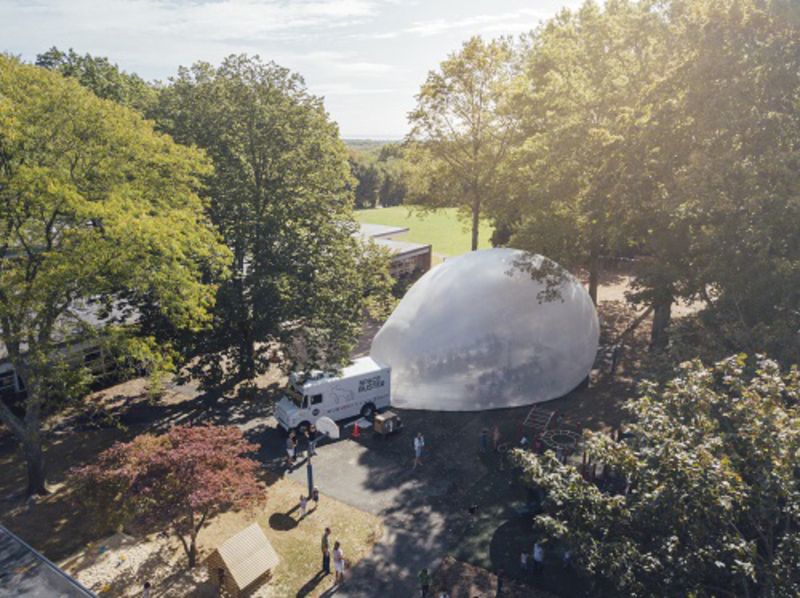 The dome, dubbed the Spacebuster, is designed and developed by raumlaborberlin, a collective of eight Berlin-based architects. It was first commissioned by Storefront for Art and Architecture in 2009 in New York City. The giant dome hatches in the back of a delivery van. People can enter into the space through the passenger door of the van, then walk through to the dome down a ramp. A fan under the ramp generates the air pressure. The Spacebuster is a not only a backdrop for events but also actively participates in them. The translucent membrane acts as a blurred boundary, so pedestrians can look into the events happening inside the billowing urban room. Images can be projected onto the membrane and can be viewed both from the outside and the inside. It can also accommodate tables and chairs, depending on the program taking place inside. Democracy Lab will feature workshops and talks by The New Yorker writer Rachel Aviv, The Simpsons show-runner and writer Mike Reiss and daily guided readings of The New York Times led by community leaders and writers such as the paper’s own critic Wesley Morris, among others. To see the full calendar of scheduled events, check out this link. 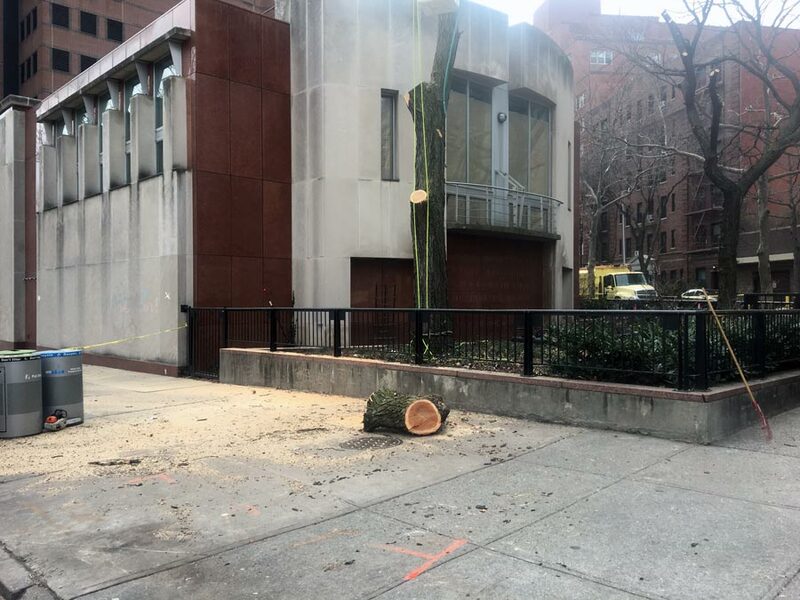 When the Brooklyn Heights Library is demolished, what will happen to the art on its facade? Community members and preservationists are worried that a local developer will pull a Trump on a Brooklyn library and send its art to the trash. 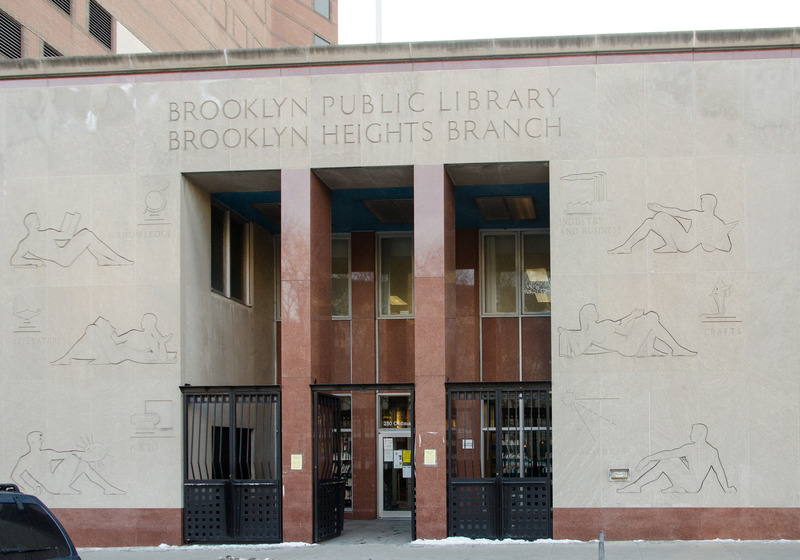 In an unusual move, New York–based Hudson Companies this week filed plans to demolish the Brooklyn Heights Library at 280 Cadman Plaza West before they close on a deal for the site with its owner, the Brooklyn Public Library (BPL). Despite assurances that the art on the facade will be saved, city officials haven't issued a commitment in writing to preserve the work. If all permits are approved by the Department of Buildings (DOB), exterior demolition could begin in January to make way for a 36-story, mixed-use tower designed by Brooklyn-based Marvel Architects. The Brooklyn Daily Eagle reported this week that the branch, which closed in July and now operates out of temporary quarters, wants to get up and running inside the new building as soon as possible to minimize disruption to patrons. (Marvel Architects is also designing the new library.) As part of the BPL's $300 million capital repair campaign, the deal with Hudson and this new—smaller—library will generate a surplus $40 million in funds that will go towards renovations at other branches. The Business & Career Library, long headquartered at the Brooklyn Heights branch, moved to the main library this summer, though the neighborhood branch will retain specialized services for freelancers and entrepreneurs when it reopens. The reduced size of the new library caught the community's attention and the deal behind the site attracted the feds. In May, the New York Post reported that federal and city prosecutors are investigating whether the $52 million redevelopment deal was a quid pro quo for contributions to Mayor Bill de Blasio's nonprofit, the Campaign for One New York. Hudson's winning bid for the library site was a full $6 million less than another developer's. Although ongoing investigations will not affect the demolition timeline, the fate of the library's facade is still undecided. 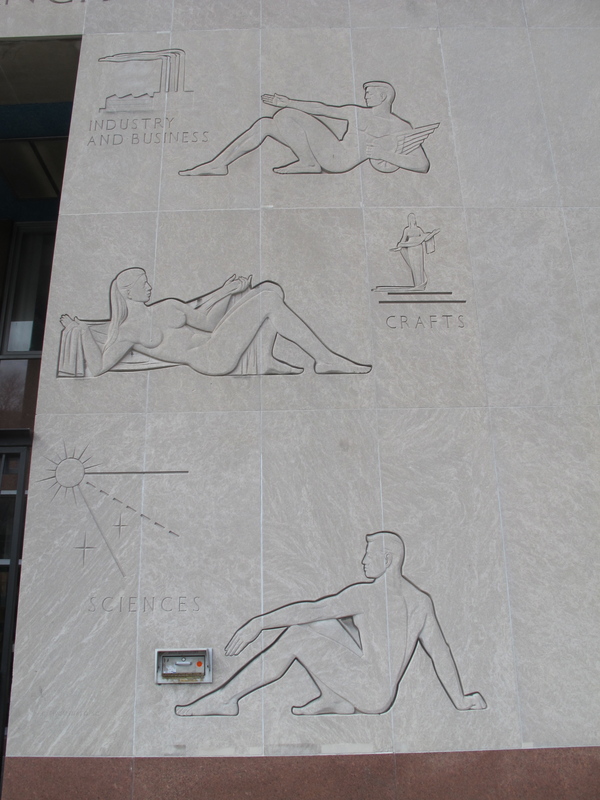 The six bas-reliefs by artist Clemente Spampinato surround the main entrance and depict industry and businesses; crafts; sciences; knowledge; literature; and arts. In New York, his architectural work graces the auditoria, gyms, and facades of public schools in the five boroughs. Back in 2011, Brownstoner contributor Suzanne Spellen (a.k.a. Montrose Morris) praised the library's art when she dismissed its "not great architecture." Designed by architect Francis Keally, one of the architects behind the main branch at Grand Army Plaza, the building opened in 1962 but looks like a throwback to the WPA era. Separated from the neoclassical post office and courthouses across the street by a grand allée on Cadman Plaza Park, it defines the character of the corridor despite its design shortcomings. 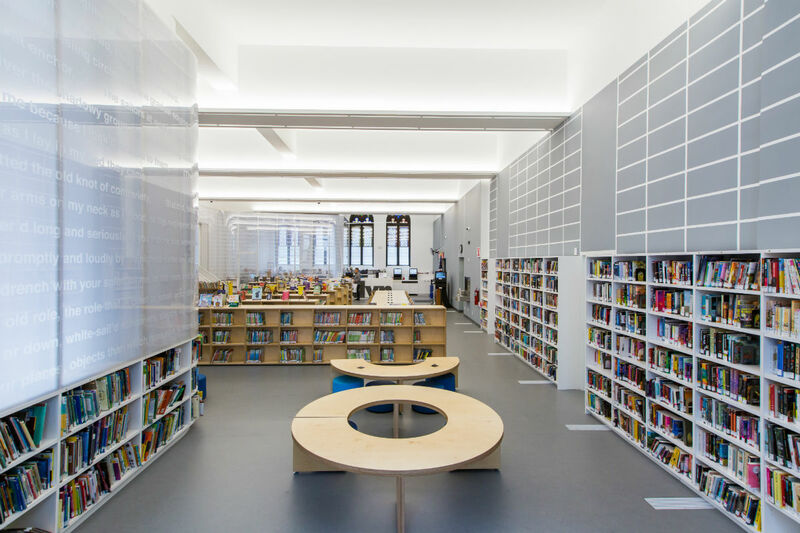 Advocacy groups Citizens Defending Libraries (CDL) and Love Brooklyn Libraries, Inc. fought hard to keep the library open in its original building, but are now hoping that at least Spampinato's work will be preserved in some capacity. "There's a longstanding tradition of incorporating art into the grand civic architecture of public libraries. From the [NYPL's] Main Branch on 5th Avenue to the library on Grand Army Plaza, art is an integral part of the identity of New York library systems," said Michele Bogart, professor of art history at Stony Brook University and former vice president of the Art Commission (now the Public Design Commission). A Carroll Gardens resident, Bogart suggested the BPL should incorporate the reliefs, which are 20 feet tall and 11 feet wide, into the new tower's branch as an important continuation of tradition and a gesture to the neighborhood losing its public facility. In addition to architectural sculpture adorning libraries, there is a venerable history of spolia in New York's public works. Simeon Bankoff, the executive director of the Historic Districts Council, a preservation advocacy group, said the reliefs could be repurposed in another municipal capacity, like the Marine Grill's opulent mosaic murals greet straphangers at Fulton Street. Alternatively, preservation activist Theodore Grunewald said the library reliefs could go to a museum, citing the Pegasus sculptures from the Coney Island High Pressure Pumping Station that now live in the Brooklyn Museum's extensive collection of architectural objects. The Public Design Commission (PDC) reviewed Spampinato's pieces when they were installed in 1963, Bogart said, and the PDC still has a chance to weigh in on the significance of the library sculpture. A spokesperson for the developer confirmed in an email that the reliefs will be saved in some capacity: “Hudson Companies will carefully remove the reliefs and store them for the duration of the construction period. The ultimate decision for the reuse will be made by the Brooklyn Public Library, which is committed to making sure they are preserved either at the new branch or another location." Echoing Hudson, a spokesperson for the BPL confirmed that the library will make the final decision about the reliefs, although there is no confirmation yet about whether "another location" means a different branch or another entity like a museum or private collection. At press time, Marvel Architects could not be reached to discuss plans for incorporating the reliefs into the new library, and PDC executive director Justin Garrett-Moore could not be reached for comment on the commission's plans, if any. 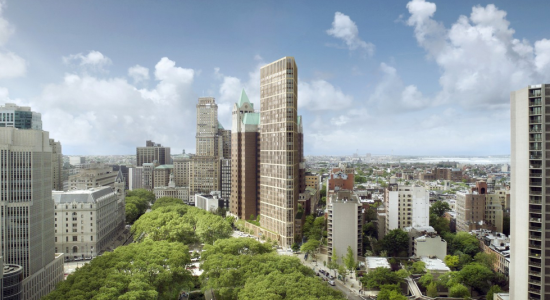 Subpoenas have been sent to multiple developers that bid on a project to redevelop the Brooklyn Public Library (BPL)'s Brooklyn Heights branch after real estate developer Hudson Companies Inc. won the project with a $52 million offer. Their bid, selected by the library with the help of the city's Economic Development Corporation, was not the highest nor did it offer to build the largest amount of affordable housing. 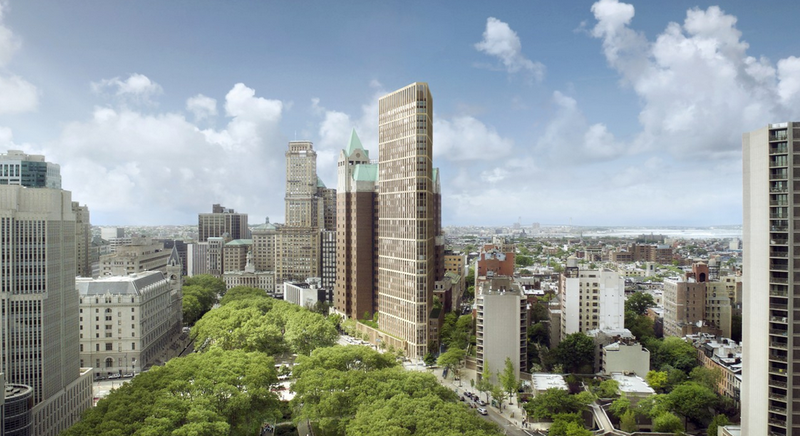 Hudson Companies' plans to redevelop the BPL's Brooklyn Heights branch on Clinton Street would include a 30-story skyscraper with 114 units of off-site affordable housing, according to an online article by the New York Post. A new, 21,500-square-foot library would be located at the base of the triangular-shaped building. The Hudson Companies’ bid, in addition to not being the highest, also did not offer the largest amount of affordable housing. 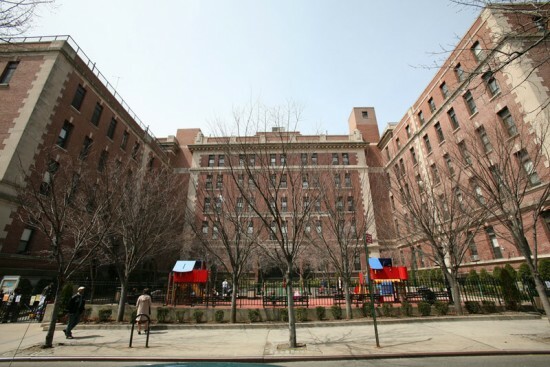 For example, one bid from Second Development Services offered $6 million more than Hudson and also included three more affordable housing (117 to Hudson Companies' 114). Allegations have been made that the bidding process was rigged to benefit the winners: both Hudson and Marvel Architects, the design firm for the project, contributed money to the Campaign for One New York shortly after de Blasio was sworn in as mayor. The charity, which promoted the mayor's agenda, also received two $25,000 donations from Toll Brothers. The Post also reports that Hudson Companies President David Kramer was also known to say that Hudson was going to win the Brooklyn Heights project, no matter what. A spokesman for de Blasio has denied that the bidding process was unfair. US Attorney Preet Bharara and Manhattan District Attorney Cyrus Vance are conducting the investigation. The Post article states that Kramer has not yet received a subpoena. 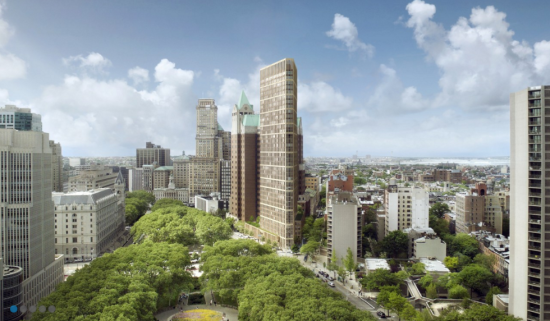 Development at 280 Cadman Plaza West was given the go-ahead at today's New York City Planning Commission meeting. Excluding two commissioners who recused themselves, the commission voted unanimously to approve plans for a 36-story tower designed by Marvel Architects. The mixed-use development will replace the Brooklyn Public Library's Business and Career Library, which opened in 1962. The development will house 136 luxury rental units, ground floor retail, and a new, 21,500-square-foot library. Commissioner Carl Weisbrod noted that the developers, Hudson Companies, would build additional retail on nearby Fulton Street, as well as develop 114 units of affordable housing off-site, along Fulton Street and Atlantic Avenue. The hearing was packed to capacity with members of Citizens Defending Libraries (CDL), a grassroots organization devoted to protecting the city's libraries from being sold to private developers. After the commission's vote, the group reacted in anger and dismay, calling members of the commission "sell outs" and noting that the commission "disregarded all that [we] said" about selling off city property. 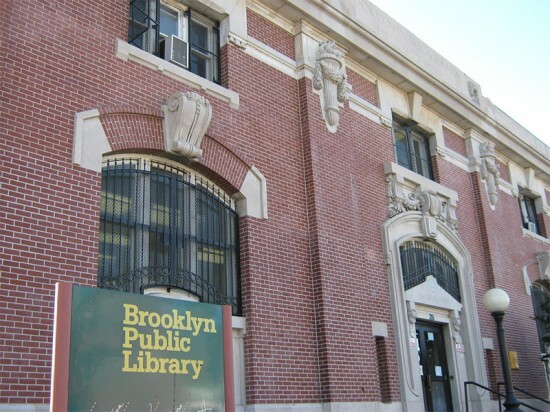 In a statement, a spokesperson for the Brooklyn Public Library said: "We applaud the City Planning Commission for joining Community Board 2, Brooklyn Heights community organizations, and Brooklynites who care about the future of their libraries in supporting BPL’s plan for a new Brooklyn Heights branch. As the Commission recognized, this project is a win-win for Brooklyn. 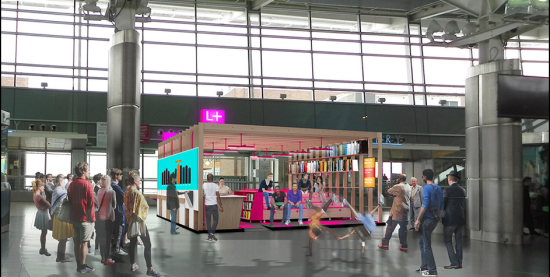 In addition to bringing a new state-of-the art library to Brooklyn Heights at no cost to BPL, it will also help to alleviate the system's capital crisis by generating more than $40 million that will be invested in libraries throughout the borough. We look forward to continuing this dialogue throughout the public review process." The library is in the midst of a budget shortfall, and the proceeds from the sale will go towards approximately $300 million in deferred maintenance across all BPL branches. CDL claims that the city bestowed a below-market deal on the developers. Michael D.D. White, cofounder of CDL, notes that the property is valued at $120 million. The commission's approval may be the final green light for the development, but judging by the intensity of the activists' disapproval, developers may encounter fierce opposition from CDL in the near future. Science fiction’s outlandish imaginings are set to become reality, with the top 10 designs for the world’s first sci-fi museum on display at the Brooklyn Public Library through May 31. Naturally, the first-of-its-kind project warrants no less than a high-tech, out-of-this-world edifice worthy of Star Trek. The winning design by graduate student Emily Yen, titled Schrödinger’s Box, proposes a 3,990 square foot modular museum comprised of a trapezoid frame with infilled planes at various heights (think staggered wall shelving). 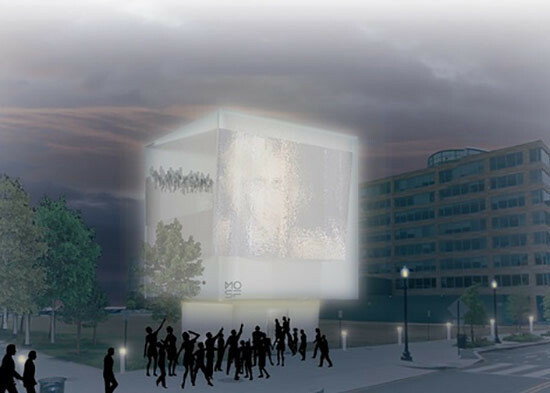 An exterior insulated plastic cube is then hung from the frame, while a flexible fabric roof pivots around the opaque projection wall “facilitating connections to the universe and beyond,” according to Yen’s proposal. “It explores the imagination that anything is possible—it’s infinite. I think [Yen’s] design really teaches you to dream big,” said Barbara Wing, Manager of Exhibitions at BPL. A runner-up design by Indonesian architect Ko Wibowo perpetuates the concept of a roving museum with a building designed entirely from boxes affixed to trailers, with each one connected to the other by electrically charged magnetic edges. The boxes will be prefabricated off-site and designed to easily detach—facilitating relocation of the museum via truck or train. Sliding steel doors protect the glass-facing sides during transportation and control interior sun exposure for when the museum is reconfigured in different locales. Aspiring simultaneously towards a galactic dreamscape and the futuristic technologies of the sci-fi genre, the museum’s interior and exterior will be informed by a “utopia” (organic) and “dystopia” (industrial) concept respectively. The building will sport an industrial-looking front made from clear-coated raw steel and silicone-insulated glass. The indoors, meanwhile, will be awash in constellation-like lighting reflected off movable stainless steel walls with a mirror-like finish. Overhead, the brushed aluminium ceiling is embedded with self-illuminating signage. Knocking the ball out of the technological park is the creator of virtual reality experience “Project Anywhere,” Constantinos Miltiadis, who proposes a completely empty, non-descript building where museumgoers’ experience is mediated entirely through a wireless head-mounted display. Users dock their smartphones on the virtual reality headset for a customized experience of navigating a traditional museum—only virtually. While the concept of windowless-basement-as-museum may seem somewhat unsettling, Miltiadis’ point about eliminating physical constraints has merit. “The USS Enterprise, therefore, could be exhibited in its real scale: it can fly above you, take off and land,” he wrote in his proposal. Jonathan Spencer, Corporate Counsel at the Museum of Science Fiction, would like to see this technology come to fruition in the near future. "Some of the concepts which we hope to be able to incorporate are to allow visitors to have an augmented reality. Of course we would still have physical exhibits but augmented reality would allow us to bring educational programs to schools," he said. The Science Fiction Museum's primary goal is to inspire interest in STEAM subjects (science, technology, engineering, arts and math) by exploring the genre through film, literature, art, graphic novels and music. Following its appearance at the Brooklyn Public Library, previews of the Museum of Science Fiction will be exhibited in Los Angeles, Milan, Mexico City, Hong Kong, Tokyo, Seoul, Mumbai, Berlin, Moscow and London. Right as the New York City Housing Authority goes public with its controversial plan to allow developers to build high rises in the middle of public housing developments, the Brooklyn Public Library is taking a similar approach with the hope of mitigating its ongoing financial struggles. The New York Times reports that the library plans on selling off the land beneath two of its branches—The Brooklyn Heights Library at Cadman Plaza and the Pacific Library on Fourth Avenue—to developers who will then tear down the buildings and carve out space for them on the ground floor of their new residential towers. But a number of local residents aren’t pleased with the Library's plans and are concerned that these modern, high-rise iterations will lack that unique community feel and cultural character found in the existing libraries. Once the Pacific Branch, built in 1904 as the first Carnegie library in Brooklyn and designed by architect Raymond Almirall, is torn down, the closest library for patrons in the Boerum Hill and Park Slope neighborhoods will be located in Two Trees' 32-story apartment tower designed by Enrique Norten of Ten Arquitectos, which will also house arts space for BAM and 651 ARTS.